Gross weight : 2000 Lbs. History : Designed in Czechoslovakia by Aero, as a replacement of the succesful L-29 Delfin, L-39 first flew on 4 November1968 and entered service with Romanian Air Force in 1982 as an advanced jet trainer and light attack aircraft. The aircraft has an all metal construction, is powered by a single Progress AI-25 TL turbofan engine. 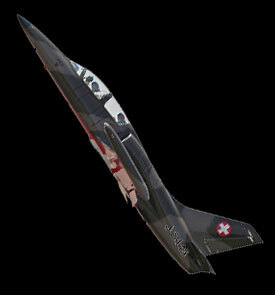 The aircraft features two wing tip tanks and a strong landing gear allowing landings on grass runways but the control system lacks hydraulic boosters, as result was never considered "comfortable" to perform aerobatics by its pilots. L-39 ZA is the light attack version, featuring four underwing hardpoints. The avionics consists in an RKL-45 ADF, a RSBN-6 tactical navigation system (very similar to TACAN), VHF radio, and a ASP-3 gyro gunsight. Two VS-1 BRI ejection seats allow the crew to leave the aircraft at 0 m altitude and a minimum speed of 130 km/h. 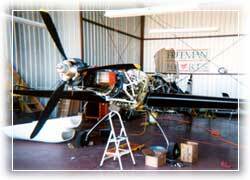 In the Fall of 2000, the regular Radical Engine was removed and the airplane is about to take off with a 740 HP Walter M601T Turbo-Prop (Jet Turbine). THIS WILL GIVE THIS AIRPLANE MORE THAN 2 TIMES THE POWER. Les Shockley, Owner of the Shockwave Jet Truck. He is the inventor of many jet applications including Jimmy Franklin's Jet WACO. He has installed the Turbine and powered the Fuel injection system. John Brown, Owner of Mizzou Aviation and sponsor of this airplane. He is the main driving force for accurate weight and balance calibrations. 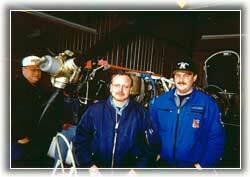 Tim Forker, Chief Mechanic of Mizzou Aviation. He has worked and works on all areas of the airplane. Ron Coit, Our wire and electronics guy. Lubac & Peter, From Walter Engines in the Chek Republic for safety issues and timing of the power system on location at the Joplin Regional Airport. Stephen Wade, From Oasis Carwash Manufacturing. He conducts aluminum work and also engineering. Dale Coffey, DC Trucking. 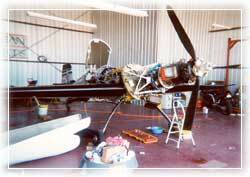 Dale does and continues to work on all the systems of the aircraft. The Eastern block countries used to dominate the aerobatics world championship. However, in the mid 80's the competition from the Western countries arose and the Russians did not do as well as they used to in their Yak 50 at that time. The Russian government did not want to allow this to happen and therefore it decided to go to the military airplane designer Sukhoi to design a new revolutionizing aerobatics plane. The engineers of the Sukhoi factory just outside of Moscow designed the aerobatical design off the Sukhoi 26 MX. The airplane was designed in order to withstand higher G-load than the competing airplanes as well as to increase its instability to allow a faster roll rate and also a more brisk stall characteristic. They came up with the Sukhoi 26 MX, an airplane wing built out of keflar and titanium to withstand G-forces up to 24 G's and an airplane frame that would withhold plus/minus 12 G's on a regular basis. A Vandenyew MP 14 radial engine was to provide thrust for this airplane. The engine is supercharged with a supercharger that will charge from sea level to 4000 feet altitude and geared close to 1:2. This allowed to put an over-sized propeller on the aircraft for increased efficiency and better thrust profile. The airplane is built very robust with a reclined seat in order to tolerate the G-forces better like the F16 has. Of note, the propeller turns the opposing way compared to all the Western aircraft's. This airplane is not the fastest airplane and also not the lightest airplane, but the engineers definitely seceded in building a very unstable airplane that is very strongly build. When Sukhoi released the aircraft for the Russian competing pilots to fly it, not everybody was capable to adjust to this radical design. It was named to be an engineer's airplane and not a pilot's airplane. The switch-over from a Western aircraft design to this Sukhoi 26 MX, is that it takes about 100 hours of aerobatics practice time in order to regain the level of competency. The Sukhoi 31 MX is the new design that came out with pilot's input. A few changes were carried out and it became a more pilot friendly airplane. The Sukhoi 26 MX is flown very aggressively and very brutally. It is a true workout. 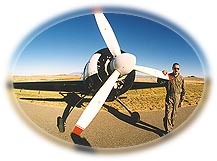 The pilot might lose about four pounds of weight during flight and has probably the highest G exposure compared to all the other aerobatics aircrafts. Since the Sukhoi 26 MX has been released, the Eastern block pilots have regained world title and have brought the level of aerobatics flying to new territory. The Joplin Project started out with changing the VFR airplane to a IFR platform, then the regular radial engine was replaced by a jet turbine power unit to increase the regular 360HP to 740HP. With this power to weight ratio the well established book of aerobatics flying has been closed and a new book for the future has been started. 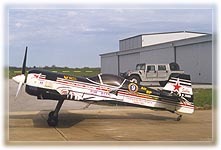 Ray Vetsch flies the Russian Sukhoi 26MX, Sponsored by Freeman Heart Hospital in Joplin, Missouri. This airplane was built in 1990, has a fiberglass keflar wing with titanium reinforcements, as well as a titanium gear and is powered with a Walter M601T Jet Turbine Prop, 740HP. The wing is tested to 24G's plus or minus and if you look at the wing, you see that it is a fully symmetric wing with a very deep cord which allows for a maximal performance. This airplane is basically built not for speed but for strength. This is a one of a kind aiplane and there is nothing comparible in all of the world. It is the most powerful weight/thrust ratio propeller airplane worldwide... The Joplin Project.